Simpson Strong-Tie gray paint; hot-dip galvanized: specify HDG. See Corrosion Information. Insert four 0.162" x 3 1/2" nails into girder. H = girder height – mudsill thickness. Measurement is top of steel to top of steel. 1 1/2" clearance hole accommodates rebar or anchor. This is not required. GH hangers may be skewed to a maximum of 45°; bevel cut required. The allowable loads are 100% of the table load. Specify GHD for saddle-style hangers. GHD may not be skewed. Loads may not be increased for duration of load. A mudsill on top of the GH is required to achieve the table loads. 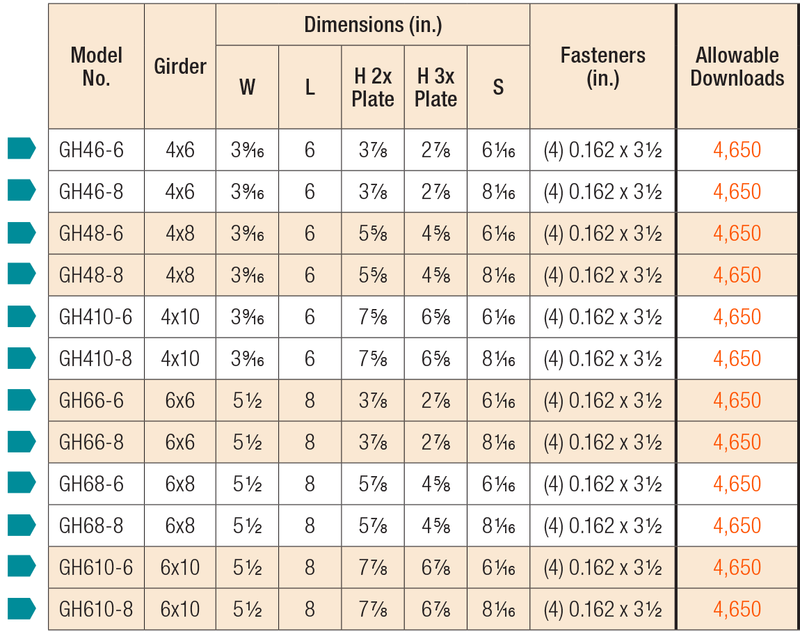 Models listed are for a 2x plate; specify "H" dimension when ordering for use with a 3x plate. Uplift loads do not apply for this connector. GH See specific model numbers for code listings.